Baracci Solutions strives to maintain an active presence in its community and in its industry. Baracci Solutions provided us with a great website that started with a strong communication, ideas, creativity and finally dependable implementation. We had a great experience with them. Baracci Solutions, under the direction of Franco, is a very organized and professional website development company. Franco and his Team are very effective in understanding their customers’ objectives and developing amazing integrated web Solutions. They fully understand current and emerging Web Technologies and know how to apply them in tailored solutions for every client. Franco and his Team demonstrated professionalism, integrity, collaboration and personal high quality values in their work and personal dealing with clients. Franco et son équipe toujours d’une réelle rigueur et d’une grande générosité. Disponible, avenant et compétent, une équipe hors pairs. When faced with revising my complex web site and best representing my company, I turned to Baracci Solutions. They were able to simplify our convoluted system, making it easy to update and status, and giving it a more modern appearance. I was very satisfied with their work. I have had the pleasure to have Franco develop on a very important and complex portal for me. His professionalism and total commitment to delivering to his customers a system that meets their expectations makes him and his team highly recommendable. Baracci Solutions has provided us with the competitive edge to become a leader in our industry. They are great; they provide us the guidance and technical support from the start to the finish of the project. I have known Franco for 6 years, we have used his company in developing our in house control systems softwares, Franco is very reliable, responsive and result oriented person, under his management and leadership we were able to get what we wanted and I highly recommend his company for similar tasks. The Baracci Team is all on the same page, customer focused. Vous avez su nous présenter non seulement un travail de qualité supérieure mais également des solutions web qui répondant aux besoins de notre clientèle tant par leur aspect pratique que par leur convivialité. Baracci Solutions m'a conduite derrière le miroir d'Alice au pays des merveilles. J'ai découvert un univers dont j'ignorais jusqu'à l'existence: la création informatique. J'ai côtoyé des gens compétents et généreux d'eux-mêmes et de leurs temps. Pour cette grande générosité et ce talent dont j'ai peine à comprendre l'engrenage, je les remercie. Baracci Solutions is proud to assist the Fondation Mélio in its ongoing mission. Baracci Solutions is honoured to be considered a friend of the Fondation Mélio. Last year, we assisted the foundation in creating its new website and online store as well as managing its social media presence. This year, we will be assisting the Fondation Mélio to create copy for their new English website version as well as designing and developing their new mobile website. The mission of Fondation Mélio is to improve the quality of life of 5000 children cared for annually at the Centre de réadaptation Marie Enfant (CRME) of the CHU Sainte-Justine. The Foundation financially supports specialized and highly-specialized care pediatric rehabilitation programs. These care programs make a huge difference in the lives of children with locomotor and language impairments desperately searching for a better quality of life. For more information please visit the www.fondation-melio.org website. Baracci Solutions assists the Fondation Mélio in its annual fundraising effort. 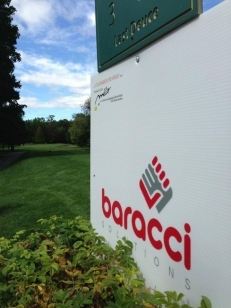 Baracci Solutions is proud to be a sponsor of Fondation Melio's annual LA CLASSIQUE DE GOLF MÉLIO/CLAIR DE LUNE at Le Whitlock Golf Club in Hudson. The mission of Fondation Mélio is to improve the quality of life of 5000 specially challenged children followed annually at the ‘Centre de réadaptation Marie Enfant’ (CRME) of the CHU Sainte-Justine. The Foundation financially supports specialized and highly-specialized care pediatric rehabilitation programs. These care programs make a huge difference in the lives of children with motor disabilities and / or language disorders desperately searching for a better quality of life. For more information about Fondation Mélio, please visit www.fondation-melio.org. Visit the newly redesigned Fondation Mélio website at www.fondation-melio.com, a Baracci Solutions creation. Baracci Solutions is going Social by launching its Social Media channels in a way that is sure to put smiles on many faces! For every new member that joins Baracci Solutions’ online Social Community, we will give $1.00 smiles to The Youth and Parents AGAPE Association of Laval and Fondation Mélio of Montréal. The call to action is simple: scroll down the page to our various social media icons located on the left side of the footer. 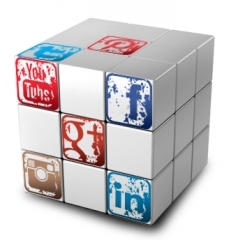 Whether you ‘Like’ us on Facebook, ‘Follow’ us on Twitter, Google+, LinkedIn, Instagram or Pinterest or ‘Subscribe’ to our Baracci Solutions YouTube channel, we will add $1.00 to our ‘#SocialMedia Smiles @BaracciSolutions’ donation jar. When our objective of 2,000 smiles has been reached we will give our donation jar to the AGAPE Association and Fondation Mélio, helping to ensure that underprivileged families are well fed and that specially challenged children are provided with a better quality of life. So please help us put many smiles on some often neglected faces by joining us in our social effort; all you have to do is Like, Follow or Subscribe to our various social media channels. If you are not online, why not then ‘drop’ by for one of our famous Baracci cappuccino’s and ‘drop’ a dollar into our ‘Summer is #Social’ donation jar? Who knows, becoming part of the Baracci Solutions Social Community might even put a smile on your face! The Youth and Parents AGAPE Association Inc. is a non-profit charitable organization serving the English speaking and multi-cultural communities of Laval. For 35 years now, AGAPE’s main goal has been to feed the needy families and children of the community. With the support of local schools, churches, organizations and independent donors AGAPE is able to arrange annual food drives as well as food distribution to over 1,250 underprivileged families. For more information on AGAPE, please visit www.agapeassociationinc.com.